The following list defines many of the words and phrases users will encounter on this site. This information does not constitute, nor should it substitute for, medical advice. Charges - The dollar amount a provider sets for services rendered before negotiating any discounts. Charges are very often different from the amount paid. Medicare or Medicaid beneficiaries, privately insured patients and uninsured patients who qualify for financial assistance rarely pay full charges. Uninsured patients who do not qualify for financial assistance may be asked to pay full charges, but often ultimately pay a lower price. Roughly 10 percent or less of hospital claims in New Jersey are paid at the "charges" rate. Charity care - Free or discounted care delivered by a healthcare provider to individuals who cannot afford to pay for the care. In New Jersey, “charity care” is a specific state program in which all of the state’s hospitals are required to care for all patients throughout the hospital – not just in the emergency room – and the state reimburses the hospital for a portion of that care. New Jersey hospitals provide about $1 billion in unreimbursed charity care services annually. To the patient, cost is the amount payable out of pocket for healthcare services, which may include deductibles, copayments, coinsurance, amounts payable by the patient for services that are not included in the patient’s benefit design and amounts balance billed by out-of-network providers. Health insurance premiums constitute a separate category of healthcare costs for patients, independent of healthcare service utilization. To the provider, cost is the expense (direct and indirect) incurred to deliver healthcare services to patients. To the insurer, cost is the amount payable to the provider (or reimbursable to the patient) for services rendered. To the employer, cost is the expense related to providing health benefits (premiums or claims paid). Diagnosis Related Group (DRG) - A system of classifying hospital services based on the presence of similar diagnosis and procedures used by Medicare to pay hospitals a fixed rate based on a specific diagnostic group. Major Diagnostic Categories (MDC) - A grouping in which similar diagnoses are organized into 25 broader or major diagnostic categories. NJ FamilyCare - New Jersey’s government program that provides healthcare coverage for eligible individuals and families based on income guidelines. New Jersey’s Medicaid program is part of NJ FamilyCare. Out-of-network provider - A hospital, physician or other healthcare provider that does not participate in a specific health plan through a negotiated contract to accept the plan’s payment rates. Out-of-pocket. - The portion of total payment for medical services and treatment for which the patient is responsible, including copayments, coinsurance and deductibles. Out-of-pocket payments also include amounts for services that are not included in the patient’s benefit design and amounts for services balance billed by out-of-network providers. For insured patients, out-of-pocket payment can be affected by a number of variables beyond copayments, coinsurance and deductibles. For example, the use of an out-of-network provider can significantly increase the amount of an out-of-pocket payment. Out-of-pocket payment for insured patients depends on the specifics of each patient’s benefit design and on the contracting status of the different providers. For uninsured patients, out-of-pocket payment can rise to the full charge for a service, although patients rarely pay full charges today. Payer - An entity that negotiates or sets rates for provider services, collects revenue through premium payments or tax dollars, processes provider claims for service and pays provider claims using collected premium or tax revenues. Examples include commercial health plans (also known as insurers), third-party health plan administrators and government programs such as Medicare and Medicaid. Price - The total amount a provider expects to be paid by payers and patients for healthcare services. The price of healthcare services often differs depending on whether the patient has insurance coverage or is eligible for financial assistance. For an insured patient, the price for healthcare services is the rate negotiated for services between the payer and the provider, including any copayments, coinsurance or deductible due from the insured patient. 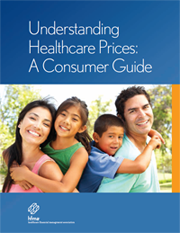 For an uninsured patient, price is first determined by eligibility for financial assistance. If the patient qualifies for financial assistance, the price is reduced according to the terms of the provider’s financial assistance policy, provided that the patient works with the provider to supply the documentation necessary to establish financial need. If an uninsured patient has the financial means to pay for the services rendered, the price could be as much as the provider’s full charge for the services, although the patient and the provider may negotiate a discount from the charge. Price transparency - Open, accessible, up-to-date and clear information for patients and other members of the public on the price of healthcare services. Provider - An entity, organization or individual that furnishes a healthcare service. Examples of providers include hospitals, health systems, physicians and other clinicians, pharmacies, ambulance services, ambulatory surgical centers, rehabilitation centers and skilled nursing facilities. Top 25 DRGs - The most common diagnoses, based on “diagnostic related groups,” at an individual hospital. The 25 DRGs will vary from one hospital to another.